Baker Hughes rig count statistics show how drilling reacted to earlier falls in the oil price. There is always a time lag of months between an oil price event and a change in drilling. There are faint signs of US drilling starting to turn down and quite clear signs that Middle East OPEC drilling has turned down. Drilling in Iraq is down significantly from 94 oil rigs in July to 56 rigs in October, but there are likely other reasons for that. The oil industry in the USA and the Middle East has changed markedly in the last decade and I believe the production response to reduced drilling will be much more pronounced in both areas than before. History doesn’t repeat itself, but it does rhyme (Joseph Anthony Wittreich). Figure 1 Baker Hughes rig count for the USA and oil price described in the text. Note how peaks and troughs in drilling lag the oil price. Also some uncertainty in drilling strategy the last three years as oil price fluctuated within narrow bounds. But the oil price has now broken down and I believe it is inevitable that drilling follows. 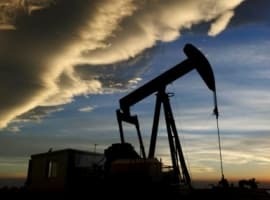 Never before has US oil production been so heavily linked to drilling activity. Figure 1 shows the extraordinary development of drilling in the USA over the past 20 years. Back in January 1995 there were 726 rigs drilling. Come 2008 that number had swollen to over 1900. Since then there has been no growth in the rig fleet – I don’t know why. Until the crash of 2008 the focus was on gas, mainly shale gas, but then during the post-crash recovery there was a huge migration away from the gas patch to the liquids plays of The Bakken and Eagle Ford. The cyclical rise and fall of drilling is closely linked to the oil price (and of course also the gas price) with variable time lags for the drilling industry to respond to the price signals. The current oil price crash is almost as steep as during the great crash. But starting from a lower height and with no clear sign of the reason as yet, it will likely not sink as low as 2008. Since 2004 supply and demand for total liquids has grown in a remarkably steady way, despite the turn down associated with the biggest financial crisis in living memory. Click on Figure 2 for a large version and you will just about be able to discern that production has risen a tiny amount above the long-term trend, a few hundred thousand barrels at most. 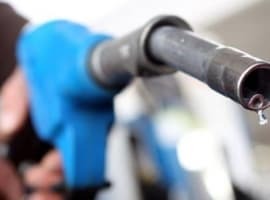 I still suspect that most of current price weakness is demand related and foretells of economic woes for some large oil consumers – the OECD, China, Russia and of course OPEC. Figure 2 Global total liquids production according to the International Energy Agency (IEA) shows a remarkably stable growth trend. Production = Consumption = Demand ± Storage balanced by price. For 5 years, OPEC has managed the production part of this equation until now. The oil price peaked in July two months ahead of the crash that began in September. Drilling peaked in September and only began to fall rapidly in December. The recent rig count statistics (below) show that drilling may have peaked in September but it is still too early to say. I expect mass abandonment of drilling to begin in December or January. Maybe someone close to the industry can elaborate in comments. 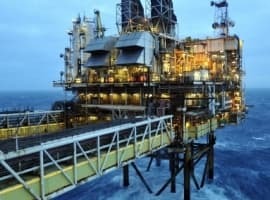 The oil industry in Aberdeen is in the process of winding down activity dramatically. You just have to look at Figure 1 to appreciate that US oil production has never found itself in this position before. Maintaining and growing light tight oil (LTO) production is dependent upon continually drilling thousands of wells. The slowdown in drilling, that seems inevitable, will therefore feed through to LTO production falling. But the fall may not be immediate since the LTO process involves drilling and fracking and then hook up to export. According to a recent email from Rune Likvern, there is a backlog of 600 wells awaiting completion. And so production may continue to rise even with drilling stopped, pouring gasoline on the bonfire of price collapse. But when LTO production does peak, the subsequent decline will be rapid, perhaps in the order of 20 to 30% per annum. With about 3 Mbpd LTO in N America, this may wipe a few hundred thousand bpd off N American production. OPEC has changed a lot in the last decade. Prior to 2005 the cartel always had several Mbpd production shut in, supporting oil prices (Figure 5). But then in the great oil bull run OPEC was called upon to produce flat out with spare capacity falling close to zero in late 2004 (Figure 5). Prior to 2005, the Middle East OPEC countries did hardly any drilling (Figure 3) they didn’t have to. But then they suddenly discovered that to meet rampant demand they had to drill more wells and the rig count for the four big producers doubled from 40 to 80. Figure 3 Rig counts for the big 4 ME OPEC producers. Iraq and Iran are not included because there is a paucity of data. Figure 4 Actual oil production for OPEC + spare capacity (see Figure 5). Figure 5 OPEC spare production capacity. Often viewed as imaginary by many peak oil commentators, you only have to observe how spare capacity merges with production to give a total capacity number to realize that political OPEC production fluctuations are real (Figure 4). Spare capacity fluctuations of 2 Mbpd or more have not been uncommon in recent years in order to balance the global oil market. The rig count has since risen to 140 in Saudi Arabia, UAE, Kuwait and Qatar. But all that drilling has not added to OPEC’s production capacity (Figure 4), though the picture is clouded by Libya, Iraq and Iran all at various stages of debility. The main point is that previously immortal ME OPEC production is passing relentlessly into the mortal world of other producers where it is necessary to drill new wells in order to maintain production levels. 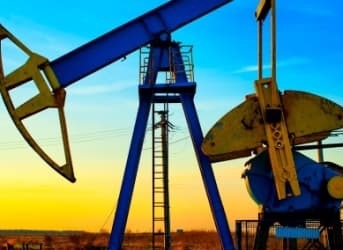 ME OPEC and the rest of OPEC, who derive much of their national income from selling oil that supports generous social services in many of the member countries, will now have to decide if they are to continue spending on drilling and other development activity or divert these funds to support government spending. I would bet on the latter and believe that we may already see a slowdown in drilling activity in the ME OPEC nations (Figure 3). This will feed through to a reduced production capacity, and so, while OPEC decided to not make a political cut, given time, a physical cut will happen nonetheless. Estimating how deep this cut will be and when is impossible without a precedent. This time next year, we may know. In perusing the rig count statistics, Iraq caught my eye. It is not included in Figure 3 because the data only starts in June 2012 and the scale is surprisingly different to the other main producers. Iraq had 96 wells drilling in June 2014 compared with Saudi Arabia’s 69. I’m not sure if Iraq includes Kurdistan. The main point about giving Iraq a space of its own is to note the recent sharp fall in drilling activity (Figure 6) that is presumably linked to the IS led insurgence in that country. Consequences currently unknown and unpredictable. Figure 6 The Iraq oil rig count has fallen dramatically in recent months. Reason = IS, consequences for production unknown, but not positive. The main point of this post was to focus on the drilling statistics of the USA and ME OPEC. But it is worth musing about the rest of the world, especially an area I know quite well, the UK North Sea. Six months ago, the North Sea needed $150 / bbl to keep going. $100 oil had postponed the decommissioning of many fields where the infrastructure is rotting under the burden of North Sea water and taxes. One does not need to be a rocket scientist to work out what sub $70 oil is going to do to an area like this. The industry had been working “eye balls out” to keep things going, spending vast sums, and actually creating a lot of prosperity. But it appears the music has stopped. The only thing that has changed in the world is that Saudi Arabia and partners have decided to not shave a couple of million barrels of production for a few months in order to maintain the stability in the oil market (see figure 5). Demand and supply fluctuate by this amount from year to year. Leaving the market to work instead will I believe result in about a couple of million barrels per day being wiped off global production capacity, not uniformly, but selecting the highest cost producers. In OPEC Venezuela looks in bad shape. In the OECD, US LTO and the mature parts of the North Sea. The exporting nations, with state owned operators, will prioritize welfare over drilling. Rig count data from Baker Hughes. Oil production data from the IEA OMR. The Technical Trend Is Down But Is A Turnaround Coming Soon? Euan thank you so muuch for these excellent graphics....but where is the world going is the question...any ideas?? ?